Welcome to Forest Park or Forest Zoo? Two paint jobs showing through on this sign. This creepy place was built back in 1962 and closed back in 1995. 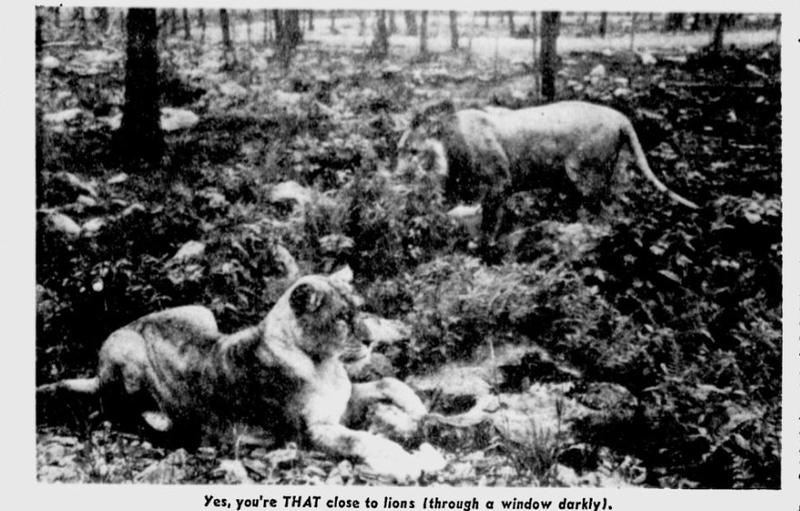 It was primarily a petting zoo, but it also had one of the popular roadside attractions of that era, a Fantasy Forest, similar to that of which Idlewild Park still has intact. This was an upstart attraction, starting off at a similar time to other roadside attractions of that time period such as Dutch Wonderland in Lancaster and some of the numerous Fairyland Forest attractions throughout the country. 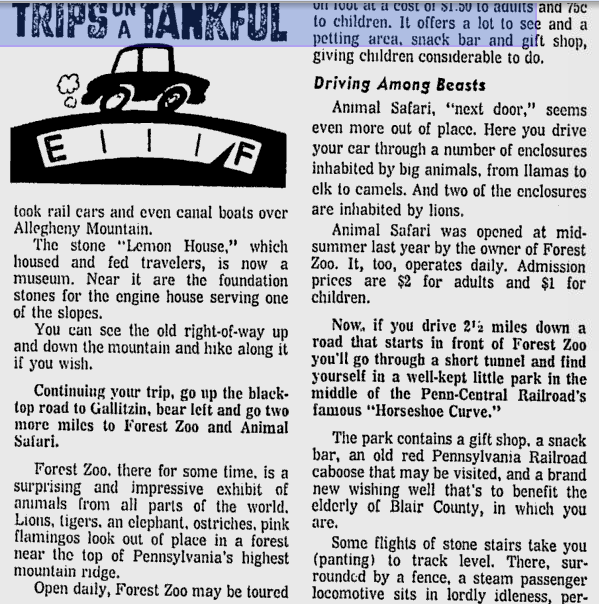 From 1973 Pittsburgh Post: It is said to have had a safari, fantasy forest, and Petting Zoo. This is one of the creepiest abandoned attractions that I have ever seen. Collapsed or partially collapsed buildings with creepy reminders of what this place once was. This would make for an excellent haunted attraction if there were any way to stabilize these buildings. Frankly these buildings need to be torn down because they are dangerous. One building has already completely collapsed. Security on a collapsed building? Odd is probably the most accurate way of describing this place. It is creepy and looks like it has not been touched in decades. At this point it would probably be best if they tore this property down and left it as an abandoned lot. Buildings sitting in this condition are unsafe. Coaster Bash 2015! This year's edition of Coaster Bash had representatives from a number of parks, including Sam Shurgott from Morey's Piers and IRM Rides, Jeff Croushore from Idlewild, Marie Ruby and Nick Paradise from Kennywood, Steve Gorman from Waldameer, Mark Turner of the current park management company for Conneaut Lake Park, Lenny Adams of Conneaut Lake Park, Tom Rebbie of the Philadelphia Toboggan Company, and even a video presentation from Jeff Filicko, former PR manager for Kennywood and current PR manager for Six Flags Fiesta Texas. It was a fun filled day with updates on many different parks. We started off with a word from the ACE Western PA regional rep, and master of ceremonies, Bill Linkenheimer III. Jeff Filicko gave us a look at the new Batman the Ride S&S Free Fly Coaster, with a brand new POV video of the ride. The more I look at it, the ride almost seems like a tracked version of a Huss Top Spin. This should be a very fun ride and hopefully can help to fill the void by those rides getting frequently removed from parks, including Dorney Park's Hang Time, the most recent loss of a top spin. First up was Sam Shurgott of Morey's Piers and IRM Rides. He gave us an informative look at Kong: the ride, the newest addition to Morey's Pier's. Kong was at Morey's a while back and they are trying to recapture the glory of that old ride with a set of Larson Flying Scooters. These flying scooters will have a decorative King Kong climbing up a lighthouse on the center pole of the ride. A lighthouse was chosen as the result of a fan competition. And red tubs...These look like they will be really sharp. Most parks have to worry about square footage when it comes to making additions. Morey's Piers, because of how compact it is being set upon ocean piers, has to focus upon getting the most room it possibly can out of additions. Kong will be built on top of a building that will house different retail operations. Next up was Steve Gorman. He focused upon the current major waterpark addition at the park. This park is really on the upswing, making many additions, improvements, and upgrades. This map outlines what the park's recent land additions have provided to the park. The red areas are the land that the the park owned prior to the acquisition. The areas highlighted in yellow are the recent additions that will be used for paved parking lot expansion. The area in blue is the area where the new waterpark expansion is being built over a part of the old parking lot, including the wave pool for this year, a new food, restroom, and locker facility, and eventual waterslide additions. Here is the rundown of the 3 acre addition to the waterpark! This is a picture of the relative plans for a kids play area. The photo was taken at Holiday World. The wave pool is an exact replica of Holiday World's, along with this new waterslide complex that will be added for the 2016 season. Here are the accelerometer readings for Ravine Flyer II. Gravity Group's maintenance standards are so precise that they have the park set up an accelerometer, have the readings directly emailed to them, and then they suggest what exact bents and track sections need work. The park then addresses those sections. Through that, the park has been able to keep Ravine Flyer II running as possibly the best maintained wooden roller coaster that I have ever ridden. Here is a photo of the new wave pool. It will be split so on slower days one half of it can be closed to cut down on electricity and labor costs. That building is a new facility that will handle infrastructure needs such as a restroom, break room, and storage. Next up was Mark Turner with the Economic Progress Association of Crawford County. This organization is now in charge of the operations at Conneaut Lake Park. This company has helped turn around different properties that have faced tough times within the county, with the goal of improving community life. Here are the plans for the park by the committee, and some of the challenges faced within this process. Everything sounded good from Mark. Things are even further on the upswing, continuing the upward trend of improvement at the park. They have a ten year plan, with quite a bit of it banking upon sale of unused park property that can help to sustain the park. The areas in blue on the map represent areas of additions and improvements. The peach colored areas show what is headed to market to help sustain the plan for the park. The plan faces major hurdles with the Chapter 11 process. The immediate goal is clean up and improvement, goals that are already being demonstrated. You can see how much improvement there is in the park just by visiting it. Just from the beginning of the season to the end last year, things greatly improved. Next up was Marie Ruby and Nick Paradise of Kennywood Park. There was some great news that Noah's Ark will see some improvements with new and updated scenes over the next few years. Here is one of the horses on the Kiddieland Carousel getting restored. The building with the games near Phantom is gutted for SOMETHING NEW! Their lips are sealed on what this addition will be. The Golden Kenny for spirit in the ACE organization was given to Adam and Tina Napotnik. Adam was the kicker for the PIAA Football 4A, runner up team, the Pine Richland Rams. Dave Hahner and Jim Futrell presented on their upcoming new book, Geauga Lake: The Funtime Years 1969 to 1995. This should be a great book. Their other books are fantastic. Lenny Adams of Conneaut Lake Park presented about his new role working for EPACC, as opposed to the Adams Amusement leaser of the amusement park section of Conneaut. Now he works as a salaried employee. He talked about how much more time he has with a set schedule and getting the chance to spend time with his family. He also talked about how great it was to just be able to focus upon the maintenance and operations of the rides. Jeff Croushore of Idlewild was the next presenter and he gave us a look at everything coming to Idlewild this season. For more reliable operations of the Wild Mouse, the park is getting all new chassis from Vekoma. The Storybook Forest section of the park is getting new vinyl facades on the story sections to last longer than typical paint. Daniel Tiger's Neighborhood, the replacement for the Mr. Roger's Neighborhood attraction, will be opening this spring. The animatronics for it are being done by Life Formations and the set designs are being done by the Weber Group. The trolleys have been completely refurbished. The last speaker for the night was Tom Rebbie from the venerable Philadelphia Toboggan Company. The company made brand new trains for the White Cyclone Intamin wood coaster at Nagashima Spa Land near Tokyo, Japan. This is the park that has the Morgan giant giga coaster, Steel Dragon 2000. Alabama Adventure's Rampage trains came in for full refurbishment to factory spec and it opened to rave reviews last fall at the ACE preview event. What color did the Koch's want the train? RAVEN RED! Six Flags America sent the Roar and Wild One trains back for refurbishment again. This has become an annual thing for them. They take great care of their wooden coasters. Holiday World sent the Raven trains and a Legend train back for full refurbishment. Legend will be back to two train operations this season. The city of Green Bay, Wisconsin sent back the train for Bay Beach's Zippin Pippin back for full renovation. Cedar Point has also made sending back the trains for their wooden coasters an annual thing. They say it is quicker to just send them back to PTC and have the trains professionally refurbished. Kemah Boardwalk continued their yearly cycle of sending a train back for refurbishment. It was a very informative night at Coaster Bash. I also thank everyone for their support with our book and in keeping the industry alive and well.